The tourist van with seven passengers landed on its side after skidding off the road to Danum Valley. 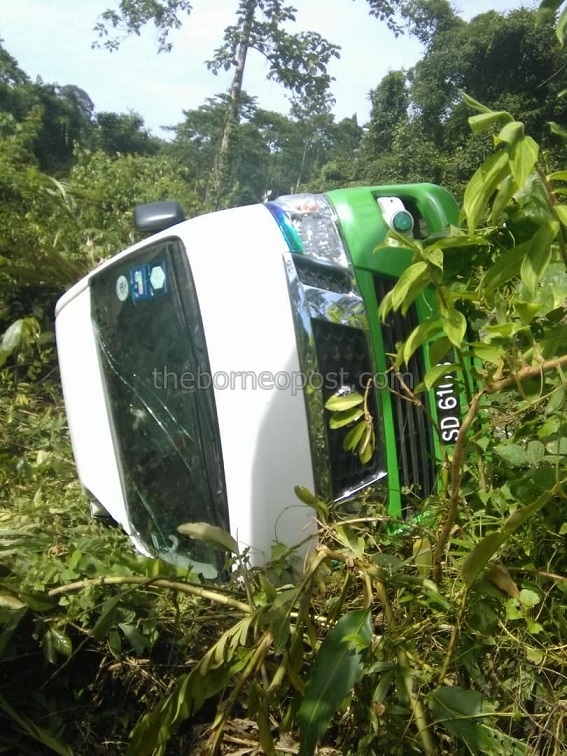 LAHAD DATU: Two couples from Selangor and Negeri Sembilan sustained minor injuries in a mishap involving the tourist van they were traveling in at Danum Valley road on Sunday. Lahad Datu police chief ACP Hamzah Ahmad said that the tourist van was heading to Danum Valley Rain Forest area when the incident occurred at about 2pm. “Initial investigation revealed that the tourist van driver lost control of the vehicle when negotiating a bend while heading towards their destination. “As a result, the van skidded off the road before landing on its side and causing four of the passengers to be trapped in it,” he said. According to Hamzah, all four passengers, aged between 63 and 66 years old, were later sent to Lahad Datu Hospital for treatment. Hamzah said the 36-year-old driver was not believed to be drunk at the time. However, investigation is still ongoing under Section 43(1) of Road Transport Act 1987. Meanwhile, Lahad Datu Fire and Rescue Department rushed two rescue assets and eight rescue personnel to the scene after it was alerted at 2.46 pm. Upon arrival, the team found four passenger, two men and two women, trapped inside the vehicle and immediately took steps to free them. The injured passengers were later taken to the hospital for treatment and the operation ended at 3.23 pm.